This security system incorporates many features that our customers have asked us for but couldn't find in a complete system. 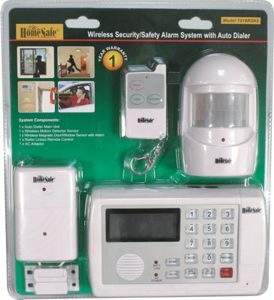 The Wireless Security System is a new and inexpensive way to protect you, your family, and your home. Read a true story from an employee whose home was burglarized - she now has this installed in her home. Why Install a Home Security System? This security system is quite impressive. It needs no wiring of any kind, and can easily be installed by anyone. Forget the high bills and frequent visits by the installation man, you've got all that you need with this entire package. So, what does the entire unit come with? It includes one base unit with A/C adapter, one window door sensor (transmits wirelessly up to 250 feet), one motion detector (ranging up to 8 yards), and one remote control that you can use to arm and disarm the unit before you enter your home and after you leave it. Encompassing an entire package deal at a fraction of the cost, the Wireless Security System comes with everything you need to get started. How can the security system protect your home? If a window or door is broken into or disturbed once the system is set, an alarm will sound and the system will dial up to 5 telephone numbers that you program into it. Any kind of movement that the motion detector picks up will be detected and the alarm will sound off as well. The only thing needed for the unit is a landline with "tone" dialing. Never be afraid to go on that needed vacation, or to be alone at your house on a dark night. The home system will keep you safe with all of its safety features. If you are planning to relocate, the wireless system can go with you, making it a good long-term investment. A big positive feature about this unit is that it allows you to uninstall and reinstall it anywhere at your leisure. It will save you money in the long run and keep your home safe. All security systems installed today cost hundreds of dollars, not to mention the monitoring fees that go along with them. You can save money, time, and the hassle by purchasing this wireless system. 4. That person will have the option to listen in on the room, broadcast their voice through the base unit (tell them the police are on the way), or disarm the system. 5. If there is no answer, or if the person doesn't disarm the system, it will dial the next number on your programmed list.